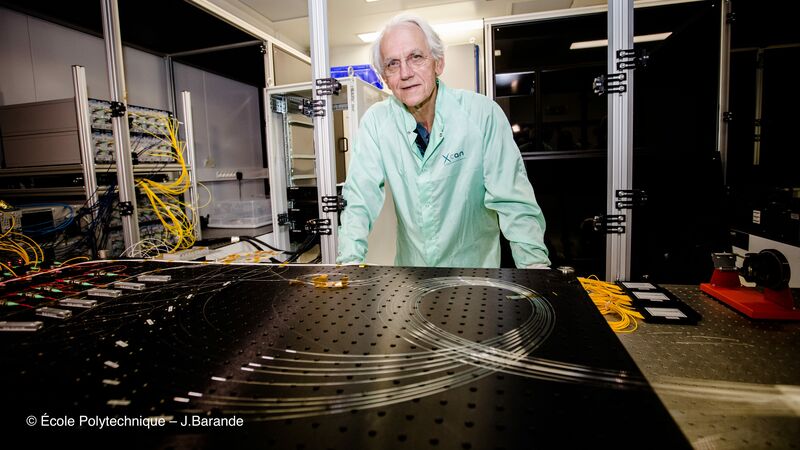 Professor Gérard Mourou, won the 2018 Nobel Prize in Physics, with Professor Donna Strickland, for inventing chirped pulse amplification to create ultrashort, high intensity laser pulses. Here, he tells Laser4Surf how he pioneered the method and changed physics forever. Why choose ultrafast laser physics? I have always loved and have been intrigued by physics; it is really the foundation of everything. When I started my PhD at Pierre and Marie Curie University (Paris) in 1973, it was only a short time after the Maiman laser had been discovered, and my adviser had just duplicated this in his laboratory. I was so excited by this new kind of coherent light and all of its possible, novel applications. I quickly started to work with very short pulses of light as I wanted to study how atoms, molecules and very small objects move. You soon moved over to the University of Rochester, US, where you and Donna Strickland developed chirped pulse amplification; how did you achieve this? As you know, power [watts] is energy [joules] divided by time, so with a small amount of energy, in a very extremely short pulse, you can reach a very high peak power. So the name of the game is to produce these very short pulses, and to amplify them to produce very high peak power. But we couldn’t do this because these high power density laser pulses would damage the laser components. So to circumvent this problem, I had this idea to stretch the short pulse before it is amplified, so you’re not amplifying the short pulse, you are in fact amplifying a long pulse that has a very lower peak power and you don’t damage your components. So Donna and I stretched the pulse, amplified it and then compressed it back again into a powerful pulse, and demonstrated that this concept worked, producing energy to the millijoule level. I then said let’s increase the energy in the pulse by 1000 times, and go from a millijoule to a joule. We had to scrounge a lot of equipment to do this experiment, but we demonstrated one joule in one picosecond [which gave one terawatt of peak power] and called the system our ‘table top terawatt’. This was a phenomenal result; back in those days, other terawatt systems were the size of buildings but our system was very compact. No, I said we need to go to higher powers, let’s go to the petawatt level [which is equivalent to an incredibly short flash short flash from ten thousand billion light bulbs]. People screamed and said ‘Gérard, you are crazy, we’re already at the terawatt level, let’s stay here’. But I was fortunate to know people at the French Atomic Energy Commission (CEA) that had very large-scale lasers that could put out kilojoules. So I decided to apply chirped pulse amplification to this type of laser. We had to have very large gratings that could withstand a lot of energy made, but with this very old CEA system, we demonstrated peak powers of 20, 50, 100 and then 200 terawatts, just by applying chirped pulse amplification. This was an enormous coup and we all realised we were opening a new field, and that was the field of the petawatt. And today, at ELI – the Extreme Light Infrastructure – we’re talking about a peak power of ten petawatts. What applications of chirped pulse amplification have interested you? 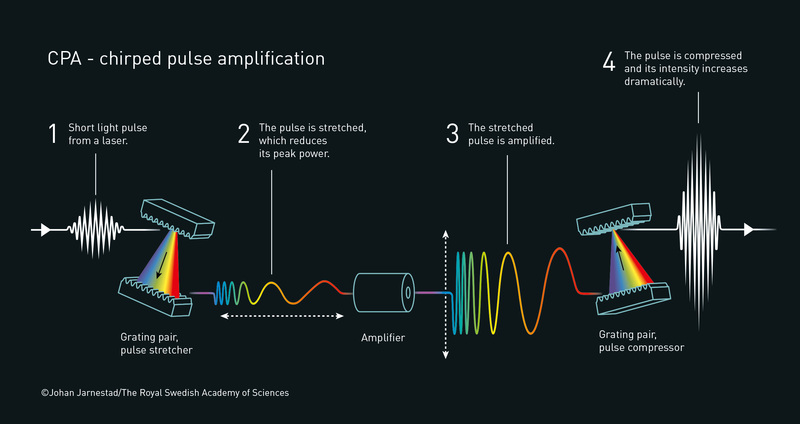 You can use these very short pulses to capture very short, very fast particle motions that only last a billionth of a millionth of a second. You can also get extremely high intensity pulses, so high that you can accelerate particle a lot faster than you can with any conventional technology. These laser-driven particle accelerators could be so important for medical applications, such as proton therapy in which medical personnel use a particle accelerator to target a tumor with a beam of protons. We also discovered another important application by accident when one of my students wasn’t wearing his safety goggles and a femtosecond laser hit him in his eye. We took him to an ophthalmologist who said that the damage on his retina was ‘perfectly round’. We realised that this was because the pulse was so short that when it heated the matter, that matter didn’t have time to move and he ended up with a very perfect ‘pit’. We immediately realised the potential for ophthalmology, and this was the beginning of bladeless LASIK. And we soon realised that these very short pulses can really machine anything. During the mid-1990s, and whilst at the University of Michigan, you went on to pioneer ultra-precise femtosecond laser micromachining – why was this important? Micro- or even nano-machining has been one of the big applications of the femtosecond laser, as you can remove matter so precisely – up to nanometre scale – and also so very fast. At the time, we were very close to Detroit and one thing that we wanted to do was more precisely control the spray of gasoline in an engine. Using femtosecond laser micromachining you could make these very, very precise holes to better inject [fuel], and this is still being used today. You are now described as ‘one of the fathers of the Extreme Light Infrastructure project’, which intends to host the most intense beamline system in the world; what is exciting about ELI? I proposed ELI in 2006, after moving back to the Haut-collège of École Polytechnique. Everyone was so excited and now, there are so many applications. Lasers have always been used in atomic physics but now, with the ultra-high intensity lasers at ELI, we can look at sub-atomic physics, the nucleus and this is a big proposition. We can also use ELI to study the vacuum and reach the point where you can materialise light in a vacuum. We can also accelerate particles with really high energy on a very compact scale; right now, if you want to accelerate particles, you need to do this over tens of kilometres, but at ELI, we will do this over metres, even centimetres. What advice would you give to up and coming researchers? You really have to like your research; you have to be passionate about it and you have to love it. I have had a very supporting family, but research can sometimes bring challenges. Many times you may be at home, but you are mentally not fully at home, as you are caught up in your scientific ideas. If you want to be an outstanding musician, you have to practice, and research is the same; there is no other way. You have to be patient and passionate. What did you think when you won the Nobel Prize? I was absolutely overwhelmed and stunned. You are just not prepared for it. You know you have a chance as you are invited to be a plenary speaker at many conferences, and you have a feeling that you might get it, but there are so many scientific advances right now. To be picked, well, you have to do outstanding work. And it’s a little bit like a lottery. But I was absolutely thrilled to have received the Prize with my former student, Donna Strickland.